To find the best cloth diapers on the market, we ran three tests. First, we tested the hand-feel of the entire diapers to ensure they were both soft and durable, including inside and outside of the waterproof shell, the absorbent cloth liners, and the elastic fitted leg openings. Second, we tested the effectiveness and ease-of use of 13 different cloth diapers on newborns, infants, and toddlers, including daytime, naptime, and overnight use. Finally, we sprayed and laundered them to make sure they didn't hold stains and odors, and maintained their softness, fit, and functionality. Not all of them did! Here are the top 5 cloth diapers we found, followed by our in-depth reviews. Parents choose to use cloth diapers for a number of reasons, including to reduce waste and environmental impact, minimize the number and types of harmful chemicals touching their baby's skin, and benefit from the softness of microfiber and natural cotton. While only about 5% of all parents use cloth diapers, it is quickly regaining popularity among environmentally conscious parents. No matter why you choose to use cloth diapers, you will quickly realize that there are tons of different cloth diaper options that vary in price, style, functionality, and effectiveness. If you want to learn more details about why to use cloth diapers, and the difference between cloth diapers and disposable diapers (we review the best disposable diapers here), scroll down to the bottom of this article. Here are the Best Cloth Diapers of 2019! 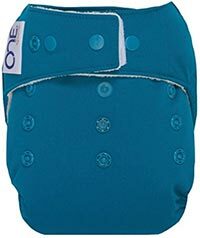 1. bumGenius Freetime All-in-One Cloth Diapers. These were by far the top-rated cloth diapers in terms of all-around comfort, functionality, and durability. We have been continually impressed with several core features of these diapers. First, we love their styles and patterns, ranging from soft solid colors like blue and pink, to modern farmhouse, floral, and even cars and trucks; a nice touch is that the snaps always match the diaper itself. Second, this is an all-in-one cloth diaper, which means there are no separate liners to clean or stuff in and out of the diaper shell - the double liners are sewn right in on the top and bottom. That means you can remove the entire diaper, rinse it off and throw the entire thing into the laundry. That's a time saver for sure, but not a space or money saver. But we prefer the all-in-one diapers for their convenience and ease of use, even if they tend to be a bit more expensive and you end up needing more of them in your arsenal. Third, the fit was excellent, especially for newborns (over 8 pounds) and infants up to around 12 months old (bumGenius says 35 pounds). This is achieved by using flexible elastic to fit securely around the sides, and a snap closure system that lets you easily make the entire diaper tighter or looser as your baby grows and becomes more mobile. One of the biggest challenges with cloth diapers is that when your baby grows larger, has more quantity of pee and poop, and starts to crawl and walk, there tends to be a bit more leakage than with disposable diapers. But the bumGenius has elastic and snaps that seem to actually do a great job holding things in and keeping things dry and secure. One of the great things about these cloth diapers is that even when they are completely soaked, they don't really get bulky, saggy, and large. Which is awesome! And washing was easy, poops didn't seem to discolor or stain them permanently, and they dried quickly in the dryer. And then you pull them out of the dryer they are completely ready to use - no more worrying about stuffing the inserts back in, or making sure velcro areas don't get snagged or full of lint. Another great feature is the fact that each absorbent pad has an inner pocket that helps it get clean at its core, and makes it possible to add an extra insert to it for overnight use (if needed, though you could also just add an extra insert without putting it inside the existing pads). Overall, we had no real complaints about these diapers. If we're being picky, the price is a bit much, coming in at around $24 each, and you'll need a lot of them to stay protected without doing laundry every day (probably about 20-25 of them). Yes, expensive, but it's still much cheaper than using disposable diapers for the first few years, it's just you're paying more up-front. A second little nit-picky thing is that the diapers use polyester instead of organic cotton, but bumGenius does offer their bumGenius Elemental 3.0 All-in-One Organic Cotton Cloth Diapers for a few more dollars each. Interested? You can check out the bumGenius Cloth Diapers here. 2. GroVia O.N.E. All-in-One Cloth Diapers. These GroVia ONE cloth diapers are by far the most absorbent cloth diapers we tested, and have excellent size versatility for chunky-thigh babies and toddlers. Not as great as the bumGenius for newborns under 10 pounds given their overall larger leg openings, but excellent for babies over a few months old and our top-pick for overnight cloth diapers. That's because this cloth diaper uses a soaker insert plus a thick liner on the inside of the waterproof cover, providing some super absorbency. GroVia says these are designed to fit babies from 10-35+ pounds. One of the really cool things we liked about this cloth diaper was the option to use a velcro closure or the snaps. If you want the convenience of quick-on-off with the velcro, it's got that covered. But there is also a great snap system to use if you're so inclined. The velcro strips snap in and out of it easily, so you can try both and decide which option you like. Even though it's an all-in-one cloth diaper, the soaker pads (it includes two) can actually be snapped into and out of the diaper. We left them snapped in even during machine washing and they stayed put. But if you have a very small wet diaper, you might consider just snapping out the liner and putting in a different one. So, it gives you a little bit of the versatility of a hybrid or pocket-insert cloth diaper, without being forced to pull liners in and out every time you change or wash the diapers. And even with their superior absorbency, they are not very bulky - in fact they are less bulky than the double-lined bumGenius. Another thing we liked about these is that they are cotton cloth diapers, using 100% cotton in the soaker, lined with polyester so that the soaked cotton doesn't sit against baby's parts and cause rashes. And they're super soft and comfortable! Downfalls? Well, they are pretty large and the leg openings aren't super elastic so they won't fit babies with skinnier thighs. And even babies with less than thick thighs might show gaps when they are crawling around. They're also pretty expensive, coming in at about $23 each, only about a buck less than the bumGenius Freetime. Note that GroVia also makes the GroVia Hybrid and GroVia All-in-One. The hybrid system allows you to use cloth or disposable liners, and the all-in-one has a sewn-in liner. Both are great options, and better suited for smaller babies, but we found that they can't quite match the absorbency of the O.N.E. Interested? You can check out the GroVia ONE Cloth Diapers here. 3. Thirsties Duo Wrap Snap Cloth Diapers. Rather than making a single size to try to span a huge range of baby heights and weights, the Thirsties Duo takes a different approach: it is available in Size 1 (6 to 18 pounds), Size 2 (18 to 40 pounds), and Size 3 (40 to 60+ pounds). In our opinion, this is a much better way of fitting your newborn, infant, and toddler with an appropriately-sized diaper, especially in the leg openings and waist. And these fit really fantastically on our test babies! This is mostly due to the variable sizing available, but also because it has snaps (or you can order it with Velcro if you prefer it to snaps) around the waist and the front rise, and a fantastic double leg gusset (double elastic at the leg opening). This last feature helped not only with making a fantastic fit, but also with preventing explosions from escaping the diaper! Nothing escapes this diaper, and that was the most impressive part about it. You just can't beat a good fit and double leg gussets for keeping things inside the diaper. The Thirsties Duo is not an all-in-one system, it is compatible with prefolds or all-in-two inserts. We used it with the OsoCozy unbleached cotton prefolds and it worked perfectly - we used the Small with Size 1 Duos, and Large with Size 2 Duos. With these, you simply lay the prefold diaper insert into the Thirsties Duo cloth diaper, and you're off the races. Great coverage and absorbency, and the OsoCozy prefolds are only about 3 bucks each. So, you take this cloth diaper cover for only about $14 and add that on, and you're at only about $17 for a complete system. Since you'll be buying about 10 or so of these, that will save you quite a lot of money versus the all-in-ones. In our testing, we found these Duo cloth diapers to do a fantastic job overall, they were waterproof, comfortable, dried really quickly in the dryer, use high quality snaps (we didn't try the Velcro ones), are lightweight, thin and durable, and have multiple colors and adorable patterns available. So overall, we think these cloth diapers provide the biggest bang for the buck, excellent versatility and mess control, and are super adorable. Also, they are made right here in the U.S.A., so keep that in mind. They are a bit more work than the all-in-one systems (bumGenius) and snap-in systems (GroVia) we tested, but that might be worth the cost savings. Other cons? Well, while the cover is waterproof and keeps the outside nice and dry, the hems along the edges of the diaper especially at the leg holes, would get wet sometimes. The fabric on the outside also don't feel as nice as some of the more expensive ones, but that doesn't really matter as much as the inside comfort. Interested? You can check out the Thirsties Duo Cloth Diapers here. 4. Rumparooz One Size Cloth Diapers. Coming in at around the same price (about $25) as the bumGenius and GroVia options, these Kanga Care Rumparooz are intended to compete with the more premium cloth diapers. This is a pocket diaper, which means that there is a small inside pocket up near the waist where you can stuff the end of the liner. What's nice about a pocket diaper is that you can perfectly position the insert however you'd like it, and it actually stays in place. The downfall is that it's an added step in the diaper change process - stuffing an insert into the pocket. This pocket cloth diaper includes two different absorbent pad inserts - one is a newborn size, and the other is a universal size. They each have a variety of snaps on the end so they can be used individually or snapped onto each other in various configurations - actually 6 configurations, and that's why Rumparooz calls them the 6r soakers. The overall design of these is similar to the Thirsties, with a double gusset elastic around the leg openings, adjustable waist snap closures, and adjustable rise snap closures. But it's a one-size-fits-all cloth diaper, so the fit is a bit large (especially the leg openings) on newborns, and a bit small on large toddlers (Rumparooz says 6 to 35+ pounds, but there's a sweet spot between 12-25 pounds). The outer waterproof shell of this cloth diaper is high quality and feels good, and the inner hypoallergenic microfleece liner is super soft and absorbent for when the absorbent pad gets over-saturated. But that microfleece liner is also what we disliked about this diaper. It tended to hold onto smells more than other cloth diapers, it adds quite a bit of bulk and makes the diaper too warm for hot summer days, and even though they say that it doesn't pill, it had pills on it after a couple months of use. So, it's a great concept because it adds an extra layer of protection and is soft to the touch, but it definitely has some detractors. The other thing we found was that the snaps are super strong, but sometimes they are so strong that they are hard to unsnap when changing a diaper. Other than those concerns, we thought this cloth diaper option had great absorbency, good versatility to span different sizes and ages of babies, and does a fantastic job preventing blow-outs. For the same price, we would probably go with the bumGenius 4.0 or Freetime, or the GroVia. Interested? 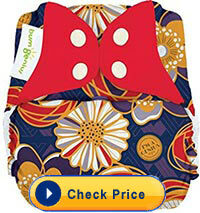 You can check out the Rumparooz Cloth Diapers here. 5. Bambino Mio MioSolo All-in-One Cloth Diapers. Here is another fantastic all-in-one and one-size cloth diaper option, with some super adorable patterns, colors, and styles, excellent absorbency, and a fantastic price (about $20) for an all-in-one cloth diaper. Being an all-in-one cloth diaper, that means that it includes not only the outer waterproof shell and inner lining, but also an attached absorbent pad that never needs to be removed or replaced for washing or in between changes. The down-fall of an all-in-one, of course, is that you need to change the entire diaper every time, rather than simply swapping out the absorbent pad. The upside is that you don't have to spend time finding the pads in the laundry and putting them back in. But this all-in-one cloth diaper functions a bit differently. The absorbent pad is not just a sewn-on flap that folds down into the inside of the diaper. Instead, it is sewn-on but hides inside of an inner pouch. To get the pad out, you pull on a little pull-out tab and it pulls it out of the pouch; to put it back in, you stuff it back into the tuck-in pocket. So, because it involves stuffing like a pocket cloth diaper, this is a bit more work than the bumGenius all-in-one that uses sewn-in pad flaps that fold down on the front and back, and also more work than the GroVia all-in-one that uses a snap-in system. The benefit of this type of system, however, is that when your baby pees it goes quickly through the outer lining and into the absorbent pad hiding inside, which keeps the moisture away from your baby's skin and helps prevent diaper rash. So we like the concept, but found ourselves thinking that it was a bit more work than we wished for in an all-in-one. We found the fabric to be soft and durable, the lining and pads to be super absorbent, it wasn't too thick and bulky, and the patterns are really adorable. The fit was pretty good, but our newborn baby tester showed leg opening gaps that made us worry about blow-outs. Bambino Mio lists this cloth diaper as supporting babies from 8 pounds and up, though we thought it was best for around 11-12 pounds and up given the leg opening gaps. Another thing we really disliked about this was the Velcro-style waist closure at the top. But let's start with how this was a good idea. Bambino Mio was smart to include fold-back laundry tabs to stop the Velcro from getting completely ruined in the washing machine, so that's awesome. And they were also thinking about the awesome adjustability that goes along with this type of hook-and-loop closure that you simply don't get with snap closures. Now for what we didn't like: well, like we suspect most moms will, we forgot to use the fold-back laundry tabs on several occasions, and found them hooked onto various other pieces of clothes and getting filled with lint and losing effectiveness. We realize that was our fault, but suspect it will be a common theme. Second, we found that the Velcro closure would dig into the tummy of our infant tester when he was sitting up, and it didn't look very comfortable pushing into the skin. Outside of those minor concerns, you're getting a really excellent and highly functional and absorbent cloth diaper for only about $20, which is a huge bang for the buck. If you don't mind stuffing the pad back into the inner pocket, and think you can remember to use the fold-back laundry tabs when washing, then you'll be very happy with these cloth diapers! Interested? 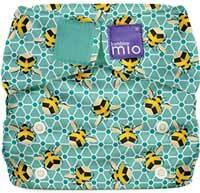 You can check out the Bambino Mio Miosolo Cloth Diapers here. There are a few less expensive cloth diapering options worth considering. Two in particular are made by AlvaBaby and Mama Koala. Both of these are simple pocket-style cloth diapers that include removable inserts. The beauty of these systems is that they are not only great cloth diapers, but they come with multiple diapers and absorbent pads for a really great price, and offer some really adorable colors and patterns. Both the AlvaBaby and Mama Koala options are about $6 per cloth diaper, which includes the inserts, and they usually come in packs of 6. The primary difference between the AlvaBaby and Mama Koala is the type and effectiveness of the inner liners and absorbent pads. In our experience, the Alva Baby Cloth Diapers include a sueded cloth liner with microfiber fabric inserts, and the Mama Koala Cloth Diapers include a polyester liner with adjustable size (snap-down) microfleece inserts. Both insert types get stuffed into a back pocket, but overall we had better luck with the Mama Koala inserts because of their adjustable size and their generally better absorbency. For parents looking to save some money with relatively cheap cloth diapers, either the AlvaBaby or Mama Koala options are great choices. There are some limitations however - the leg openings are only single-gusseted, they are one-size and are very large for a newborn (especially around the leg openings) and surprisingly small for a baby over about 20 pounds, they aren't recommended for babies under 8 pounds, and the inserts are nowhere near as good as the premium ones offered by the other brands. One option is to buy higher quality inserts like the AlvaBaby charcoal bamboo inserts that will do a much better job with absorbency. We get this question all the time from expectant and new moms wondering what the pros and cons are for disposable versus cloth diapers. And there are a ton of differences that are worth considering. Below are some of the major ones. What we want to point out is that neither diaper type consistently wins in any category. The most important thing is that you're making the diapering decision that works best for you, your baby, and your lifestyle. Environmental impact: Over 20 billion disposable diapers are thrown away each year, and each one takes about 500 years to fully decompose in a landfill. And it's 500 years only if they are exposed to oxygen and sunlight, which tends to be unlikely when they are deep in a landfill pile. And as they decompose, they release harmful CFCs that hurt the ozone layer. But cloth diapers have also been subjected to some harsh criticisms, including the toxic chemicals used during cotton production, and the fact that the detergents and soaps used to launder cloth diapers also have very negative environmental impacts. Cloth diapers also require much more electricity use over their lifespans to run your washer and dryer, and they also take much more water to produce than disposable diapers, and use more water for washings. So realistically, while many parents choose cloth diapers to reduce landfill waste, scientists have concluded that the overall environmental impact is the same for cloth or disposable diapers. We encourage you to make the decision that fits your unique lifestyle rather than using environmental impact alone to justify your decisions. After all, it is up to you to make the best decisions for your family! So do what works. Chemical exposure: Disposable diapers contain a ton of scary chemical ingredients, including dioxins, dyes, fragrances, volatile organic compounds (VOCs), plastics, petrolatums, and other chemical compounds such as TBT and Sodium Polyacrylate. That's not to say that all of those chemicals are coming in contact with your baby's skin, but they do seem to be related to higher rates of childhood asthma and respiratory challenges. The question is whether cloth diapers are any better, given the harmful chemicals that are used during the production of cotton, microfleece, and polyester. With some of the challenges of outsourcing manufacturing of baby products to countries like China, we suggest going with a cloth diaper company that prides itself in how it sources its contents and where it manufactures its products. Thirsties are made right here in the USA, and bumGenius cloth diapers are made in USA or Egypt. All the others are made in China. You can also check out some of the charcoal bamboo inserts, or the unbleached cotton inserts that are available. Cost: In our experience, cloth diapering is lower cost than disposable diapering if you calculate cost over the long term. Of course, it is difficult to factor in the cost of electricity and water to launder cloth diapers, or the cost of trash pick-up with disposable diapers. But on the face of it, cloth diapers have a much larger up-front cost to get established into a cloth diapering routine that is efficient and flexible. That usually means purchasing at least 15-20 cloth diapers, and extra absorbent pads and inserts, which can run you upwards of $500-700. But theoretically that purchase can last you all the way through to potty training. Disposable diapers, on the other hand, are likely about $1500 for that entire time. The only way you'll get close to that cost with cloth diapers is if you subscribe to a monthly cloth diapering service, need to switch sizes several times along the way, or purchase the really fancy cloth diapers that are upwards of $50 a pop. So, theoretically cloth diapering can be less expensive than disposable diapering. But once you consider the time and energy (mental, physical, and electrical) involved in laundering cloth diapers, the cost to you might not be worthwhile. Convenience: Cloth diapering is not the most convenient practice in the world. Not many parents who use cloth diapers would try to argue that it is more convenient than using disposable diapers, unless maybe they have a nanny who does the dirty work for them! You can't beat the convenience of disposable diapers. But it's worth pointing out that the all-in-one cloth diapers are designed to be much more convenient than the traditional pocket cloth diapers or using the classic prefolds with safety pins. The all-in-one diapers function similarly to a disposable diaper, except that you need to clean the entire thing after each use. So not only are the all-in-ones more expensive, but you'll likely need to have a much larger stash of them in the house. Cloth diapers and their inserts are also a bit larger and heavier for your diaper bag (see our best diaper bags here), and make things much more complicated when you're out of the house. You will need to have a great wet bag for carrying the dirty cloth diapers or inserts around with you. Traditional flats and prefolds: These are the cloth diapers that your parents and grand-parents may have used with their babies. They are big pieces of cotton fabric about the size of a dishtowel. The flats need to be strategically folded to increase the absorbance in certain areas, and prefold diaper inserts already have a more absorbent strip down the middle of the fabric. These are the cloth diapers that you see in cartoons with the big safety diaper pins on the side. Traditionally, these were used along with a second layer of fabric or a waterproof cover to help keep clothes dry. Pocket cloth diapers: Pocket cloth diapers combine a diaper cover with a waterproof outer liner and a soft inner liner, with inside pockets that are used to hold absorbent inserts. Pocket cloth diapers are great because they hold a well-positioned insert exactly in place where you want it to be. But they are also a bit of a pain because they need to be separated for washing and then reassembled after drying. All-in-one cloth diapers: These are the most convenient cloth diapers and the most similar to the disposable diaper. They include the waterproof outer liner, a soft inner liner, and sewn-in absorbent inserts that stay with the entire diaper. Thus, during a diaper change, you can take the entire diaper and throw it into the wet bag or laundry, rather than fussing around with inserts. The disadvantage is that you will need more of them at home and on the run, and you will ultimately need to do more laundry (bigger loads and more frequently). A good example is the bumGenius all-in-one. Hybrid cloth diapers: This is basically the same as an all-in-one, except that instead of the absorbent insert being sewn into the cover, it is removable. Typically, this means that the insert will snap in and out. This is great for when your baby just did a #1 in the diaper and you can quickly swap out the insert rather than putting the entire thing into the laundry. It's also much easier than a pocket cloth diaper given that the insert simply snaps in, which means no stuffing inserts into tiny pockets. And you can have fewer overall diapers than with the all-in-ones, which can help you save a little cash. A good example is the GroVia Hybrid. There are a couple other things to consider about cloth diapers. First, you cannot use all types of diaper rash creams on cloth diapers, because zinc oxide or titanium oxide will badly stain the fabric. Check out our reviews of the best diaper rash creams, including several that do not stain cloth diapers. Second, you might want to consider purchasing a cloth diaper sprayer that attaches to your toilet. This adds a convenient spray wand to your toilet that you can use to rinse off the yucky stuff right into your toilet, before you put the diaper or insert into the laundry. Many parents using the bathroom sink for this job, but you'll realize that as your baby grows into a toddler and has firmer poo, they become much more appropriate for the toilet. A good option is the SmarterFresh Cloth Diaper Spraying System, which is excellent and very reasonably priced. Third, using cloth diapers does complicate things a bit when it comes to swim diapers. Cloth swim diapers are really just designed to hold in any solids that might come out while swimming, but are not designed to hold in any liquids. A good example is the AlvaBaby cloth swim diapers. But of course this can be an issue with babies who have bowel movements that are very liquidy. So for swimming, you might want to consider a disposable swim diaper. Fourth, when you wash cloth diapers, you need to read the manufacturer's instructions. Across brands and models you will find different washing instructions. Most of them suggest washing in hot water, and bleaching once every month or so, but you need to read the instructions for the specific cloth diaper that you end up choosing.